"My Gray Weathered Chair" was first featured on my blog HERE. I love planting in the chicken wired seat, lined with either moss or coco liner. This year the only plant in the chair seat is a hot pink superbells calibrachoa hybrid. Along my with other calibrachoa and petunias, this plant has been plagued with first cutworm caterpillars and then aphids. Now, it is coming around and filling in. 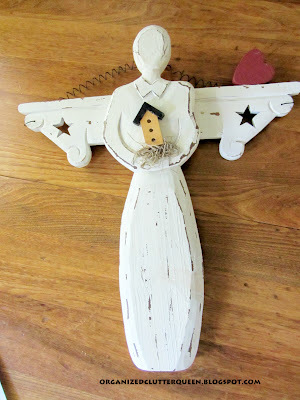 The wooden garden angel was a thrift store find earlier this spring for $4. I broke the heart off of her shoulder and removed the birdhouse and Spanish Moss she was holding and added an old spoon that reads "Bless the Blooms". I hope this calibrachoa fills in even more in July and August, before the Minnesota September frosts! Love your sweet little chair. I heart the angel too. So chippy, so charming!!!! Ooo Carlene, love that!! I just found a similar chair in my parents smokehouse yesterday and since it needs re-caning, I might just try this. Love the chair and the angel. And your flowers look good. Thanks for sharing at the All Star Block Party. 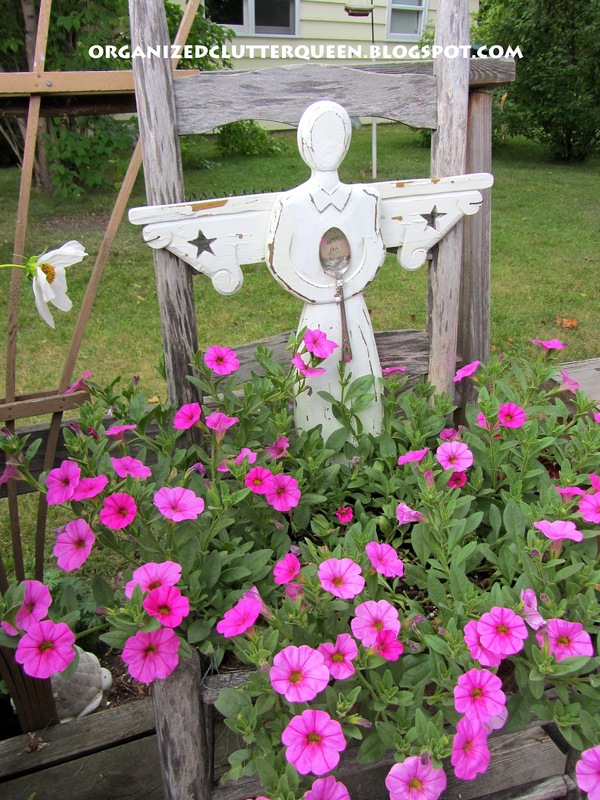 So pretty & I love your garden angel too! I just adore all of your garden art! This chair is fantastic and then you go and make it even more special with the addition of this sweet angel! Your garden angel is so cute. 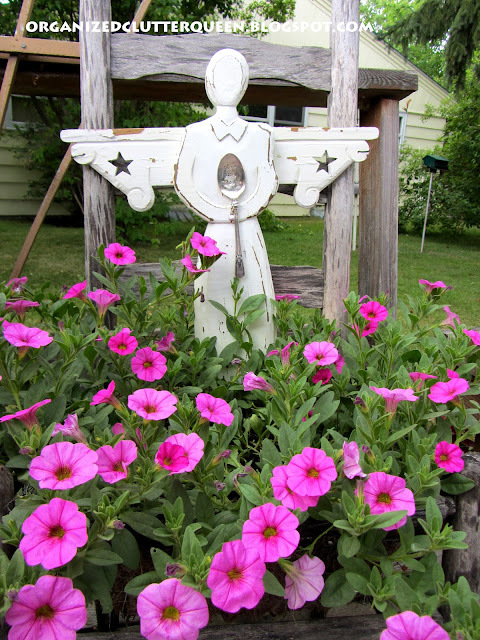 Like your changes in her and your Calibrachoa looks good in spite of the cut worms. That weathered chair is the perfect shade of gray to set off those pink blooms! I'd love if our fence was that same weathered gray, but unfortunately I'm stuck with bright cranberry. Ewwww. I think the only thing the worms got were all the morning glories I planted. I probably won't have a single bloom!!! I love this old weathered gray chair Carlene! And the addition of the angel is perfect! What a fun piece to have out in your yard. Love the chair with the pretty blooms and what a great way to update that sweet angel with the spoon!Great idea! I have lots of "country" 80 things that need some updating like that. Great look and the flowers are filling in nicely. I love the angel and the spoon and of course the chair! Carlene, This is just the cutest garden idea! The angel holding the garden tag spoon is just so sweet! What a great garden project to share at my new linky party, TUTORIALS TIPS AND TIDBITS going on now! So creative! I hope you join in! 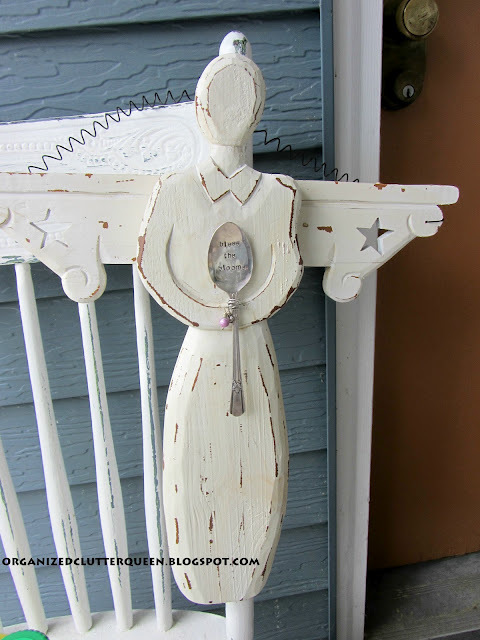 Love the chair, angel and the stamped spoon. My flowers like yours bit the dust already down here in Texas. They were sooo pretty, too. What a great find your angel was. I love the idea of her holding a stamped spoon. I just started making those this week! Guess what my garden angel will be holding tomorrow!!!??? :) Visiting from T & T party. You made her look so much more purposeful and wonderful... less country and little more "junky" - in the best way. I love how she is keeping watch over your troubled flowers. Your chair is so cute and the angel finishes it off! Flowers look beautiful, but I know how you feel I have the same problem this year for the first time! This looks just too cute... I LOVE IT!!!!! The whole thing with the chair the angel and the flowers... oh and I love the spoon!!! Just adorable. Thanks so very much for sharing this at the ALL STARS BLOCK PARTY!!! How cute! Love that sweet spoon she holds. Thanks for linking up to Share the Love Wednesday!